AgeMatch is for people who want to meet someone significantly older or younger than themselves. You'll find older women and younger men, and older men and younger women looking for each other. It is free to join but you have to upgrade to communicate. If you are looking for "age gap" relationships you may find that traditional dating sites don't meet your expectations. Age Gap Relationships: What are They? AgeMatch.com is there to match older and younger singles for romance and casual relationships. The benefit is that most people there are upfront about what they are looking for. Whether you're a younger man seeking a mature woman, or an experience lady seeking fun with a toy-boy, this site exists to help you find your match. After a toy boy or a mature older lover? To get started you will need to complete a quick joining form, and supply an email and optionally a telephone number. Most of the other sections can be skipped if you're in a hurry to take a look around. The free account that everyone starts with upon joining can be upgraded at any time to a Gold membership (compare plans). Like most social sites, the more details you can add to your profile, the more interests you're likely to attract. It's important therefore to put some thought into what you write. People assume that on dating sites they will automatically be found when someone searches. But this is not the case. You'll only be matched based on the information you've added. Empty profiles and those without photos won't match any criteria and therefore are likely to be buried way down where nobody can find them. The Fun Questions section of the profile let's you answer a few pre-canned questions. Answering these can give people a deeper insight into your personality and lifestyle because it brings up subjects that you may not have thought about. A Gold membership will cost you $29.95 for a single month but this gets cheaper if you subscribe for longer. Once you upgrade this gives full privileges to email, live chat, online forums as well as the more advanced search options. 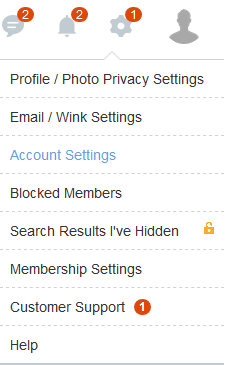 Other perks of full membership includes the ability to upload more photos and find out who likes you on the Let's Meet page. More importantly, during searches, if you have a Gold account you will be given the privilege of appearing at the very top of the page which means you will likely receive more attention. AgeMatch claims that you should receive about 6x the number of responses. If you prefer to browse on your mobile or tablet, there's an app for that. After signing up you can download the app for various devices including Android and iPhone. AgeMatch is one of the few of its kind that deals with dating and age gap issues. In addition they offer some resources and advice for age-difference romances. They also provide some quirky time-fillers such as a photo rating page called Let's Meet, and some first date ideas. Rss Feeds. Subscribe to comments for this site. [?] Receive updates about Agematch.com directly through your newsreader. This site, agematch.com is totally irrelevant, it keeps saying forbidden each time i try to access and they claim their service is international???? Someone needs to tell them that restricting countries is wrong. AgeMatch 1.75 3 A review of AgeMatch. AgeMatch is for people who want to meet someone significantly older or younger than themselves. You'll find older women and younger men, and older men and younger women looking for each other.